Italian deli. Just seeing those two words strung together makes me drool a little. Ah! The scent of freshly baked bread, meats, cheeses and the hint of garlic that fills the air. I adore it. Not to mention, pizza, desserts, and other specialties are a sight to behold. Once you step foot inside Siena Deli at Eastern Avenue and Tropicana Ave. Your senses will be awakened, you might become overwhelmed. It is okay, I understand the choices are endless. I am here to help. When you first walk in you’ll be tempted by a selection of gelatos, cookies and other Italian desserts. Then, you’ll spot the case that houses salads and sides, followed by handmade Italian sausages, deli meats and cheeses. There are all kinds of goodies to take home, but the options do not end there. 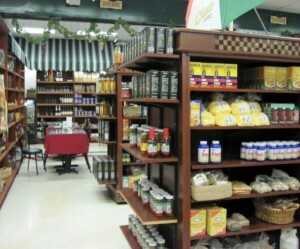 They also sell imported Italian goods: canned tomatoes, olive oil, vinegar, large variety of pastas, snacks and other treats. They even sell kitchen gadgets that can be hard to find elsewhere. For example, a couple years ago my husband bought me a Pizzelle Maker so I could finally make my own. His grandma got me hooked on these light and crisp cookies many years ago. Fortunately, I was able to get her recipe before she passed away. I think of her every time I make a batch. It was a gift I cherish. But that’s not all; I haven’t even touched on the best part. The restaurant. When you walk past the refrigerated cases you’ll notice menus overhead listing salads, appetizers, hot and cold sandwiches, and a bunch of entrees. Caprese, garlic knots, calabrese, eggplant parmigiana, subs, lasagna, pizza, etc. Hungry yet? Once you make your selection you’ll place your order at the back counter, then you can grab soda, beer or wine up front near the register. You’ll hand over your check to the cashier, and you’ll be given a number in exchange for your paid tab. Then, you can take a seat at the tables inside or there is also outdoor dining available. When your selections are ready they will be delivered to your table. We order eggplant parmigiana, the Sicilian sub, and a slice of pizza and then we share. The eggplant parmigiana fulfills the need for comfort food; it’s breaded and fried tender, and it drips with zesty sauce and oozes melted cheese. Yum! The Sicilian is refreshing with crisp lettuce and tomatoes, robust salami, capicola, mortadella, ham, vinegar and oil. It’s quite possibly the perfect blend for a deli sandwich. 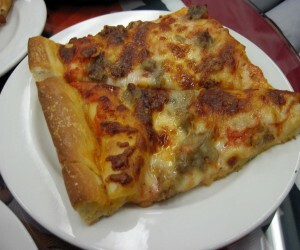 And last but not least, the pizza; it has a wonderful buttery crisp crust, topped with a light layer of sauce, gooey cheese, and your choice of topping – sausage is always a safe bet. It’s a lot of food, we usually struggle to finish, but it’s too good to let any go to waste. We never leave room for dessert, but the gelato, Italian ices, tiramisu and cannolis look delicious. One day we must try them, until then we’ll continue to enjoy our trifecta, and other goodies we take home. 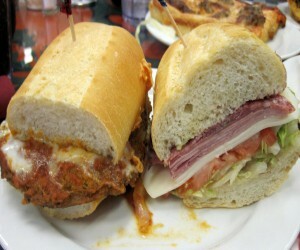 Siena Deli is located at 2250 E Tropicana Ave. Las Vegas, NV 89119, it is open Monday – Saturday 8:00 am-9:00 pm. Closed Sundays. Wow, this looks like a place I’ve got to go and check out! You’ve made my mouth water! The “trifecta” sounds delicious. Eastern and Tropicana? I’m there! Do check it out! The food is delicious!! This is almost as good as New York/New Jersey deli’s. I go there several times a week. My husband recommends the calamari salad. Thanks for the tip, I’ll have to check out the calamari salad — good ones are hard to find! I have been there a hundred times. The Pasta Fagioli is in the top three in town! This place is the best! Hand-crafted gelato (no mixes), house-made bread and Italian cookies, and Italian music videos on screen (very stylish). Try the cavatelli with sausage sauce — It is absolutely one of the best pasta dishes ever. But be prepared — it is very rich so will probably work for two or three meals for most.